When this video reached 777 (biblical number), I was reminded to encourage our readers to see how even just the Name of Jesus Christ, when spoken with respect by a politician, can inspire the hearts of millions of people. It's really important for us at Christmas time to think about that, maybe to let our pet-peeve political narratives take a back seat for a moment, and just let the power of the Name of Jesus resonate throughout the world. Whatever you think of President Trump, you'll search in vain for another world leader today who would dare call Jesus Christ "Lord and Savior”. Yes, but he doesn’t mean it! So say the never-Trumpers. Perhaps not, but he said it. He cared enough about you and me and Christians all over America to say it here in a most Christophobic moment in our history. He said it, and, really, there’s no downside to the fact that he reminded the whole world (last Christmas and then again this Christmas) that Jesus is what this Season is all about. Sometimes I fear that after Nancy and her minions get through destroying this man in a few months, we'll all look back on the Trump years as something of a last hurrah for Christian Americans. History may well record how President Trump stood as the last American president who tried to do the right thing by patriotic, Christian Americans. Despite his flaws, he tried to be on our side, tried to take us into account, tried to represent us when most of the rest of the world was trying to lock us up—but we told him to go to Hell. I'd say, instead of joining in on the flogging of Mr. Trump, let’s pray for him this Christmas. And, while we're at it, please share this video! What fun it would be if the first RTV video to hit 1,000,000 views was, in fact, the one praising the leader of the free world for saying of Christ the King: “He is Our Lord and Savior Jesus Christ”. Whatever you think of Trump, he's right about that! Merry Christmas, Mr. President. Whatever they do to you, never give up on your Lord and Savior Jesus Christ or the folks all around this country who follow Him. 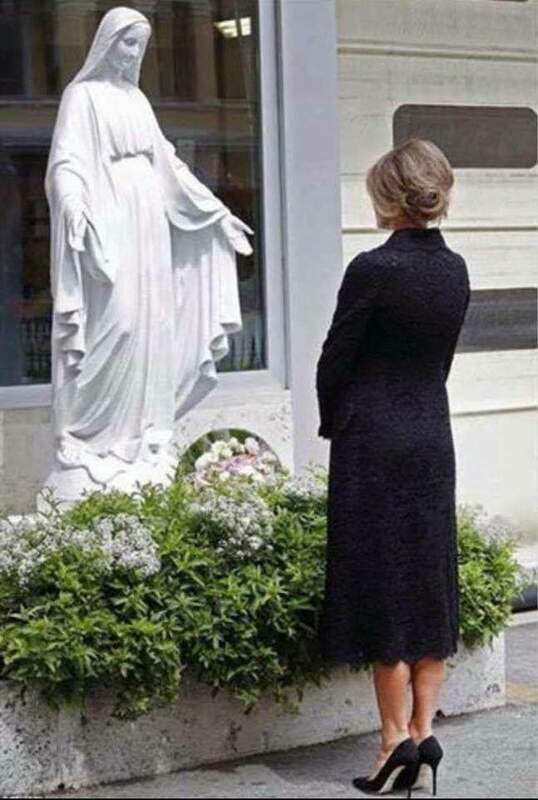 Melania Trump stops at a statue of Our Lady during her and Trump's visit to the Vatican.